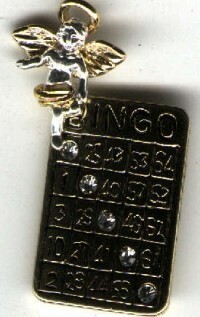 Lucky Bingo Angel Pin ? A lucky angel on your shoulder. Who knows? Maybe you will win more money (or lose less). It surely cannot hurt. Buy a few prior to your trip to Las Vegas or to any gambling casino. Beautiful gold finish with rhinestone enhancements. This pin will give you many years of enjoyment. S/H 95 cents for up to four pins. After that 15 cents more for each additional pin. Buy an assortment! They make great gifts. You can get bingo, blackjack, roulette,craps.slots and poker angels Each pin is individually wrapped and carded. The scan does not do this pin any justice. Until I learn how to do it better it'll just have to do.